This great reader submitted setup comes from recent Mac switcher Brian D and features an iMac 27″ that is backlit with some Ikea LED strip lighting, an iPad 2, and an external 18″(?) display atop the iPads box. 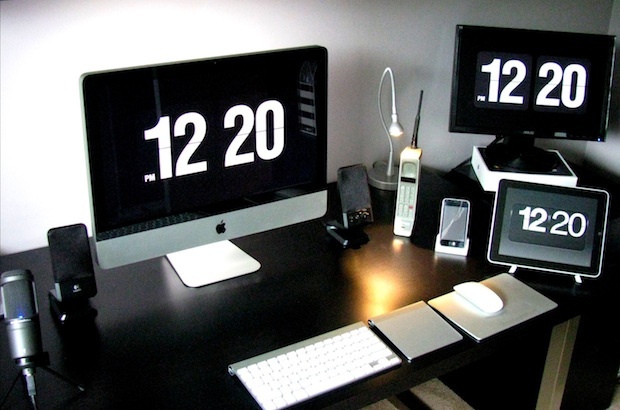 All of the screens are running the classic Flip clock screensaver, Fliqlo, which is one of my personal favorites. Elsewhere you’ll spot an iPhone, a retro cell phone, Apple’s classic wireless keyboard, Magic Trackpad, and Magic Mouse, but few cords thanks to a customized Ikea desk with grommets drilled to hide all the cables. Congrats on the switch to Mac and thanks for sending in this great setup Brian! Is an Apple Backlit External Keyboard Coming Soon? Hey I have the same desk, ikea rocks! Any idea what that lamp is? I really like it. It’s from Ikea. Jansjo LED work lamp $9.99. Anyone have the time? What time is it? I think a more important question is: How is running on the iPad? Anybody know? It’s FlipClock65, a free iPad app. iPad is connected whit airdisplay or simillar srceen sharing app. why ruin this awesome setup with a 1970s cellphone????? Waiting for a call from Gordon Gekko. 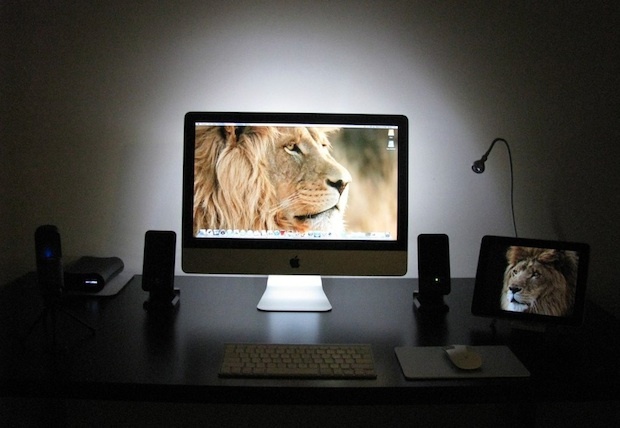 Is the backlight made of those LED light strips from IKEA? Yes, they’re from Ikea. Here’s a photo of them. It’s the Vika Amon table with Vika Moliden legs. Here’s a trailer for the desk. And whats that under the HDD? In the second picture I see a very old phone beside the iPhone on the right side of the picture. Any ideas what kind of phone it is? And if the person who’s desk setup that is is around, why are you keeping such an old phone?